Death. We don’t like to talk about it. Some don’t even like to think about it. For us as Christian people, we know that there is life beyond what we experience here on earth. This is simply a temporary home for us, and true Victory- true life- is in Heaven with those who have gone before. But the fact is that no matter how much we don’t want to talk about it, eventually our time on earth ends and those we leave behind are often faced with making decisions on our behalf. This is where the Christ Lutheran Cemetery Board can be most helpful. I turned to board Co-Chair Marlene Kaiser for some background information, and what she provided me was more than I could have expected. I have personally had the opportunity to attend a burial at the cemetery (located just west of 82nd Avenue at about 147th Street, right next to Silver Lake Country Club) and know it to be a well-maintained piece of land, but I had no idea that there wasn’t a professional service to come in and collect the trash that is left behind- that falls to the seven members of the cemetery board. They also do a major spring and fall clean up, leave flags at the gravesites of our veterans for Memorial Day, and work with funeral directors and the various maintenance companies who take care of grass cutting, snow removal, and fertilizing to keep the grounds looking their best throughout the year. There are also two men not on the board who are a tremendous help with debris removal and upkeep; Marlene tells me the board doesn’t know what they would do without these two wonderful people! 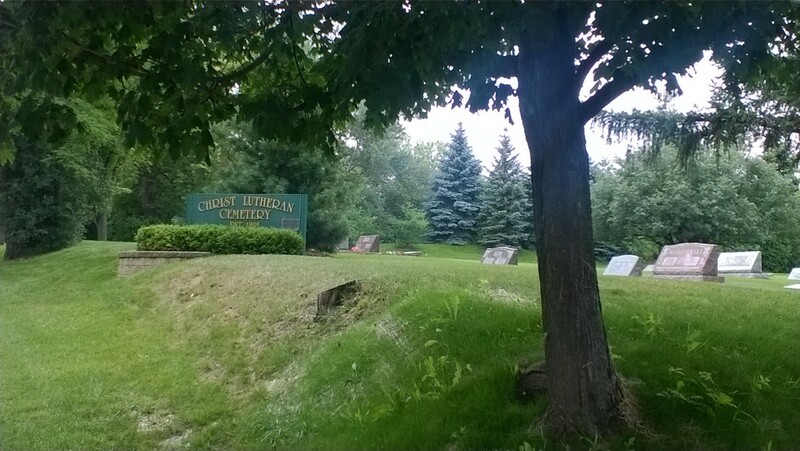 Formally established May 1, 1906 when the property for the original section was deeded from Carl and May Storz to the Trustees of the Evangelical Lutheran Christ Church, Christ Lutheran Cemetery became a part of Orland Park. Mrs. Kaiser goes on to tell, ” An additional section immediately south was purchased on March 3, 1986 from Violet Kaster. This allowed two driveways off of 82nd Avenue for a separate entrance and exit. On August 5, 1991 an exchange of land was made between the owners of Silver Lake and the cemetery.” Prior to the church owning the grounds, there were eleven burials. The first one was Baby Vogt, on November 4, 1883. More than 100 years later in 1995, the present sign was installed to replace the cast iron gateway placed in the early 1900’s which now alerts people to the cemetery coming from both directions of 82nd Avenue. And though it may not seem that large from the road, there are a total of 2,058 spaces in the cemetery (850 of which are still available, and can be purchased by contacting the Cemetery Board through the church office). Plots are currently available to any Lutherans and their immediate families, which would include spouse, children, grandchildren, parents, brothers and sisters. It is truly a beautiful, well taken care of property, and when asked, Marlene responds that she wishes more people knew that this peaceful place was a part of our church. One of the many ways the cemetery serves the community is through an annual service on Memorial Day. Beginning at 10am, the service is lead by Pastor, as well as Music Director Sandy Knopp and the Christ Choir. The local American Legion comes to present colors and do a gun salute, and the Cemetery Board places flags at the graves of all of our veterans prior to the service. It is a service well worth attending and I would encourage you to bring a lawn chair if you may need a seat, and come out next Memorial Day to say thank you to those members of Christ Lutheran who have served our country. How lucky are we to have these grounds so close to our church home, and so lovingly cared for by its Board, to help take the sting out of death when it is finally our time to rest? 1 Corinthians 15:55- 57 “Where, O death, is your victory? Where, O death, is your sting?” The sting of death is sin, and the power of sin is the law. But thanks be to God! He gives us the victory through our Lord Jesus Christ.